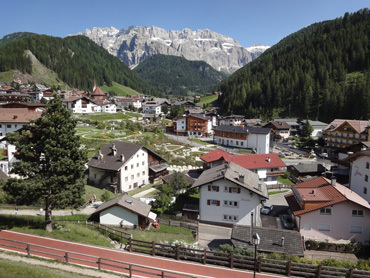 The view of Selva from our new 'pre-season' apartment. "I feel like I have come home" was Bill's grinning response while we ran the drill one last time by hurriedly unloading our bikes and panniers, this time from a the belly of an idling bus instead of a train car. We finally had arrived at our destination: Selva di Val Gardena in the Italian Dolomites. The bikes looked helplessly lame as they laid in the heap with their front wheels off but we didn't care; we turned our attention from our scattered belongings so as to revel in the snow-laced mountains embracing us. We felt a little sheepish as it was the first year we hadn't earned these grand views by biking from the sea to Selva, a ski village at about 5,000'. But at least we were here and here on time to pick-up the keys for our rented ski apartment. It had taken us a little less than our allotted 2 weeks to travel the 1,600+ miles from the northern coastal border of Portugal to Bolzano in the eastern Alps of Italy, almost entirely by train. We biked a few of those miles--far fewer than anticipated. We didn't count them, but the dozens of times we loaded and unloaded our bikes and hoisted them on and off trains and up and down rail station stairs had taken its toll on my lower back and sacral-iliac joint. When the tourist info man in Bolzano, Italy urged us to take the bus for a little more than half of the 50 miles to our village for traffic safety reasons, I jumped at the chance. I was questioning whether I'd be fit for hiking at all when we arrived and skipping some of the most challenging mountain riding we do in a year would certainly tip the balance in favor of healing rather than worsening my condition. The man at the tourist office also confirmed that the bike path scheduled for completion in 2006 was now finished from Bolzano to near the Brenner Pass. The next day we rode the first 25 miles of it, our first full riding day in more than a week, delighting in seeing stretches finally finished that we'd lamented not being open to us in previous years. Happily, the steady grade that began pulling us up the valley wasn't too much for my back. Ah-choo! 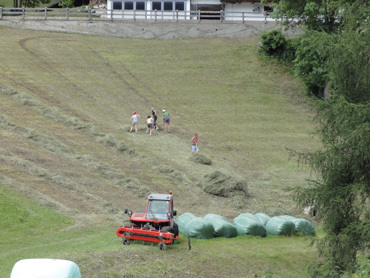 Hay raking on steep slopes was a daily sight. Leaving the train travel behind was a huge help in my healing process. The stresses of lifting even a little of our load each day had cost me dearly. Our long days on trains and in train stations hadn't allowed the opportunity to ice the injured tissues and sitting seemed to be the worst position for it. My sports massage therapist had wisely coached me last year when I dislocated my shoulder by saying that my "body would remember" when I resumed riding and that again seemed to be the case with this injury. The chance to get more massage time, to ice, and to limit my sitting had created an opportunity for it to heal and the well patterned rhythm of cycling seemed to support the irritated muscles in resynchronizing again. Knowing that we could take the bus the last miles to Selva left us with 2 days to spare. In addition to the loaded riding day out of Bolzano, we elected to ride the next segment of the wonderful bike path towards Brenner Pass as an out-and-back ride, expecting that unloaded riding would be even better for my injury that suddenly showed every sign of being on the mend. Then to play it safe, we'd travel by bus to Selva a day early, just to be sure that we made it on time regardless of unforeseen events. We gasped the next day while waiting for our bus to Selva at a tiny train station when we learned that the regional trains weren't running because of a strike. Transportation strikes had been one of our biggest worries during our dash to the mountains as federal government austerity plans were trigging public sector walk-outs all across Europe. This strike would not affect us, but it was a set back for the young woman who told us about it. The train crews were striking in Portugal a few days after we left that country and now they were striking in Italy, 2 days after making our last hop by train--we'd just squeaked by in our traverse of western Europe. Our good fortune was underscored when we learned that we could move into our first Selva apartment a day early--we were again collecting on one of the advantages of striving to be low season travelers. Better yet, our new hostess upgraded us to a larger apartment with a better view when we arrived. It was then that we also confirmed that there had been snow on the ground 6 days earlier and the weather had improved just before we arrived. Just like when we return to our legal residence in the States each winter, we were greeted by both welcome and unwelcome changes in Selva this year. Not only had the Bolzano to almost-Brenner Pass bike path been completed, the new and almost-completed tunnel at the nearby, lower village of St Christina was now in use and was siphoning off almost all of the traffic on the road that we usually bike while in the mountains. They'd iced the cake by repaving the worst of the formerly over-used road in the center of the village so now it was a delight instead of a terror when we rode the route for our big market day each week. 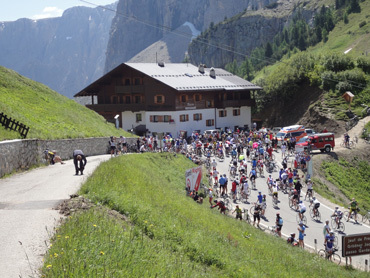 The Sella Ronda riders leaving Passo Gardena. But market day turned out to be a bust. The EuroSpin discount market in the even lower elevation village in our valley, Ortisei, was gone. We were heartbroken. They carried some favorite foods that weren't available in at least a 30 mile radius of Selva and some of their products were half the price of those in the few other area markets. We took a deep breath, paid the resort-town prices at the remaining stores to stock our pantry, and made a note to haul-in a few more specialty items next year. In prior years we could do 2 of the 4 passes and return to Selva against the flow. This year we bailed for safety reasons after cresting only 1 pass. But hours after we returned to our apartment shrouded in disappointment, we learned that there was an unadvertised fleet of 'sweep' buses to clear the road of cyclists as soon as the 7 hour road closure ended. Next year we'd do 3 of the 4 passes in the proper direction and happily hitch a ride home on a bus at 3:30. The other side of Passo Gardena on the annual Bike Day. Then there was the bad news from our usual apartment hostess--the apartment where we would stay for 2 weeks when it opened for the season. A friend had mailed a small box of ours to her on our behalf, a box that contained our climbing gear; Bill's stash of hiking maps and guide books; and some small items that had allowed us to shave a little weight and bulk from our bags, but the box was held-up by customs in Milan. They'd notified our hostess of an invoice problem but she'd received no package or reply in response to her correspondence. We'd increased our stay in Selva from 2 weeks to 3 weeks for additional hiking and climbing and now our specialty gear might not make it at all. The loss of those items would change our hiking plans for a total of about 8 weeks while in Italy and then Austria, so we held our breath hoping there would be a happy ending to the story. As is often the case, there was little to do with all of these rearranged expectations than to savor the good news and finesse our way around the bad news as best we could. Some of the bad news could be remedied by spending more money than planned, like on food, though we'd probably draw the line at replacing the climbing gear and instead shift to lower elevation hikes. Luckily, the box arrived after almost 2 weeks on the shelf in Milan. Fortunately this hail came down after we were in for the day. We hoped the late snows would fall into the 'good news' box instead of the 'bad news' one: we hoped that the snow that fell 6 days before our arrival would be the last snow for the summer season. There was however enough snow pack on some of our favorite trails that we'd be lucky to do them at the end of our 3 weeks stay in Selva. Catapulting ourselves from the sea to the mountains almost entirely by train de-conditioned us more than anticipated. We had expected to weave a few hours of cycling into many of the days but that turned out to be sheer fantasy. Instead we were quickly resigned to taking turns a few times a week to take short walks in city parks while waiting for the next train. We knew that we'd suffer some de-conditioning in our eastward journey but we'd forgotten that spending a week or 2 pedaling our way to the Dolomites not only raised our fitness level to its annual peak but the process also deposited us in the mountains nicely altitude acclimated. That lost acclimation opportunity quickly came to mind as I huffed and puffed on our bike path rides out of Bolzano. We had thought snow or stormy weather might rein in our activities by arriving in the mountains a week earlier but it wasn't 'them', it was 'us' that necessitated the moderation. Ferrata hikes had to wait a week. But Val Gardena is a stunning valley with amazing mountain peaks and slopes and nothing would prevent us from having a grand time while we did our remedial training without our climbing gear. We started with old favorites. Charging up the Stevia path riddled with log stairs always pushes our CV workout to its limit as we accumulate around 2,500' gain in a little over an hour of maximum effort. That leaves me with near crippling stiffness in my legs for 2 days after the first outing of the season but the exhilaration and views are irresistible. Walks up Val Lunga or "long valley" are perfect antidotes for overdoing it on Stevia as an hour walk up the valley keeps our elevation gain under 1,000'. Walking the path to the next village down the valley, St Christina, is even more forgiving, except that we come back loaded down with all of the groceries we can carry in our back packs. 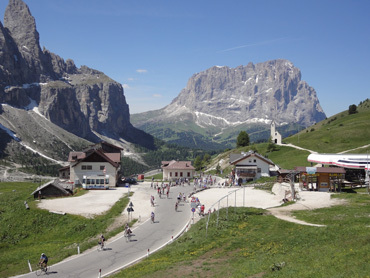 The Sella Ronda Bike Day gave us the thrill of riding a pass without either our load or whizzing cars and motorcycles. And the bikes also got called into service for bigger buying sprees at the markets. It wasn't hard to craft a new itinerary every day during our preseason week to create either a hard or easy training day, in the saddle or on our feet. Our 2010 traveling season began in Morocco in March without our bikes. Our lodging was generally on the "Very Disappointing" end of the scale but even a couple of the more awkward places had reasonably pleasant terraces. Strawberries became cheap and plentiful while we were in Morocco and we drifted into late afternoon retreats to the terraces with heaping plates of fresh fruit. In addition to the strawberries, we'd add oranges, apples, pears, and dried dates to the mix--nothing exotic but they were lovely in our blue plastic folding bowls and eating them created a soothing interlude on what were often jangling days. Reviving our Moroccan ritual of mid-afternoon fruit plates. 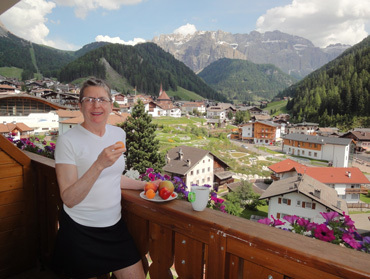 Since we weren't in good enough shape for all-day hikes when we arrived in Selva, we renewed indulging in late afternoon fruit plates on our private balcony that had a stunning view of the "Sella Gruppa" peaks. Ah...cups of fennel or 'fruit of the woods' herbal tea; a fruit plate (sadly, without berries); the sounds of the rushing river; and looking over our flower box brimming with purple petunias to gaze upon the mountains was a captivating combination. What could be better after our 2-3 hour mountain walk and picnic lunch before settling down in front of our computers or catching up on the international news? Expanding upon our brief experience late last summer with barefoot hiking in Austria was another way to add pleasure and delight to our less ambitious days in Selva as we rebuilt our fitness. In addition to padding along barefoot where we could, we inaugurated our much anticipated Vibram 5 Fingers on the mountain trails around Selva. We'd taken the 5 Fingers for a couple of short spins in Morocco but it was here, in the Dolomites, for which they had been purchased. 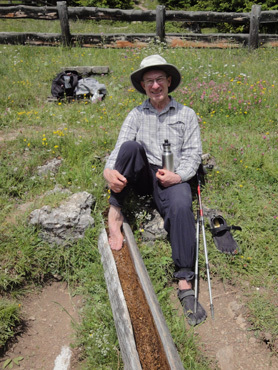 As hoped, they let us have almost all of the strength and mobility benefits of being barefoot without suffering unduly when on gravely paths, of which there are many in the Dolomites. Like the rest of our bodies, our feet needed moderated training sessions to adapt to the new circumstances, but we were committed to not being in a hurry--for awhile. Bill "icing" soon after banging his toes. 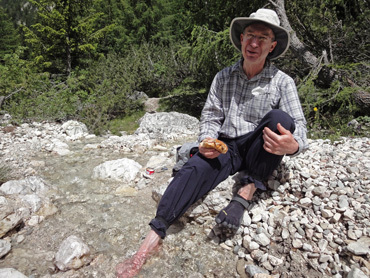 We had more mishaps with our minimalist footwear hiking in the Dolomites than we'd had barefooting in Austria. My first day out in my 5 Fingers caused in a blister where there was a manufacturing flaw in the shoe lining at the base of the big toe. The next day out I did a long stint of bare footing to let my blister recover while Bill carried on in his 5 Fingers. I was pleased with the barefooting experience but 48 hours I later developed a couple of mild infections around tiny splinters. I hadn't even noticed them before the deeply burrowed, tiny slivers started reddening my skin. The lesson learned was not to duck under conifers that have sloughed woody bits of bark. Bill dug out the tree-bits from my soles and some well placed tape on my blister allowed me to go off again the next day in my 5 Fingers. Bill got a little too rambunctious at the 2 hour point of wearing his 5 Fingers one day and landed on his bum on a gritty descent. The really bad news was ramming 2 toes against a wooden drainage board across the trail. The pain immobilized him for a few minutes and then he continued on, very slowly, with both trekking poles, until we found a wooden pipe directing snow melt into a pond. After soaking his toes in icy water for 20 minutes, he was able to walk normally and almost pain-free the rest of the way home. Another chilling toe dip in a bucket a few hours later and he declared himself fit for light hiking the next day. Bill's toe injury slowed him down for more than a week. But diligence on his part paid dividends as what had the potential to be a slow-to-heal joint injury made good progress. It was the 'icing' in mountain-cold water 4 times a day, plus elevating it, that limited the damage from the considerable swelling. A week later, I suddenly experienced immobilizing pain in the arch area of my right foot while barefooting. We finally decided that I must have torn some obsolete scar tissue that was getting in the way of my new foot mobility and that the 'healing crisis' was a positive episode. We came to that conclusion because nothing important seemed to be injured as I had absolutely no diminished function of my foot: I could move it every-which-way with abandon. The problem was the raging inflammation from the tear that puffed my foot so much that the skin itched. So, like Bill, I was icing my foot by full immersion in snow melt 4 times a day and elevating it for hours at a time. It was quite painful the multiple times a day that it ballooned and became hot to the touch and yet it was like nothing had happened each time that the swelling was controlled. A week later: yet another mid-hike, snow-melt "icing" for his toe. But despite the setbacks and minor injuries, we were both delighted that the Vibram 5 Fingers were enabling us to proceed with our "fuss training," or "foot training," as one elderly, grinning German speaking woman described what we were up to. We both loved the freedom of movement afforded by the ultra light footwear and the liveliness we experienced in our feet, whether training or not. 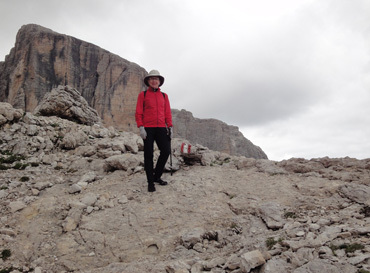 Last summer I began studying the gait, posture, and foot placement of the few men and women on the high Dolomite trails that whizzed by us and everyone else with ease. I was envious of their speed and stability. I was also jealous as they looked far less likely to kill themselves on the trails despite going at least twice as fast as we were. I studied them as best I could when they flashed by and read online about mountain running technic to learn their secrets. I made some progress in 2009 in shifting my walking style to being more like theirs but it was when we were wearing our 5 Fingers that I felt like I'd cracked the code. The epiphany came from combining a one-liner comment I spotted online with the heightened awareness and mobility afforded by wearing our 5 Fingers. The online comment was that some lifetime barefoot African runners point their toes when they run. I experimented and experimented with that notion and one day I connected with it while lightly running downhill in my 5 Fingers. Suddenly, for a couple of minutes, everything changed in my posture and gait. On the way back to our apartment I again tried the toe pointing intention on a curb that I used for low balance beam training and my so-so balance was instantly improved. On our way to being unlikely looking mountain runners. Bill and I both fiddled with the intention of pointing our toes as a part of our shift from heel striking to forefoot striking and the results were magical. For days we could only really bring it into play while trotting downhill but gradually we spent more of our hiking hours using the new technic. Within a couple of days of learning how to further exaggerate the toe point and plant, I felt like I'd gotten a new pair of knees. On one morning's descent, I immediately noticed that the very familiar creaky, ratchety, and unsteady feeling in my knees on steep downhills was gone; it was completely replaced by a solid, smooth action of those formerly tentative joints. Over the coming weeks, the near-chronic swelling around my knees disappeared and the shape of the supporting muscles changed as well. After decades of coddling my knees along I suddenly felt like I'd stumbled upon powerful magic--instead it was going back to the basics--barefoot biomechanics. My years of struggle on hard descents to keep my feet under me so as to stay off my bum were all but gone as I was no longer slipping backwards. My hamstrings became supple without stretching them and the decades of tight calf muscles that Bill experienced were suddenly a thing of the past too. Getting into minimalist footwear that gave our feet more mobility and us more choices in foot placement was the elixir we'd both longed for for decades. Curiously, when we slipped our sandals back on, we struggled to replicate the 'zone' we'd discovered. Only with great attentiveness could we barely recreate the more effective foot dynamic while wearing sandals if we were on the best training ground--downhill slopes. We were enchanted. Not only were our individual struggles with stability on the trail and comfort in our bodies melting away with barefoot and minimalist footwear hiking, we were poised to have the security and confidence of the high mountain runners. And it wasn't long until our trekking poles that had been essential for keeping us alive became excess baggage, even on 30+%, gravely descents. The lateness in our lives of changing our gait would keep us from ever being as fast as the local mountain runners we admired but at least we now had many of the safety benefits of their skills. One of the curiosities of being in the Dolomites, in South Tyrol, is the strong Germanic heritage in this corner of Italy. The German language is preferred over Italian and the prevailing culture has more of the "All is in order" quality of the Germanic cultures instead of the more "Oh well" approach favored by much of Italy. And during the half dozen times we've lingered in the Dolomites, we've been amazed by the number of Germanic visitors on the trails and in the villages. When we've had the chance to chat, it was always clear that more vacationers were coming to the area from countries to the north of Italy than from Italy itself. And especially on the high trails, "Guten tag" and not "Buon giorno," was the proper greeting. But 2010 was different. First we noticed that the overheard conservations on the trails and in the markets were almost always Italian, not German. Then we noticed that more of our apartment building neighbors were speaking Italian. And for the first time ever, we were repeatedly driven off of our Selva balcony and inside, behind closed doors, to shield ourselves from screaming children, emoting parents, and cigarette smoke. Our tranquil mountain stay was suddenly less tranquil as we struggled to maneuver around a more stereotypic Italian parenting style than we cared to be living next door to. Pretty Val Lunga was being trashed by the visiting Italians. As the weeks went by in Selva we noticed the amount of litter on the lower trails was skyrocketing, with the litter gradient being highest near the parking lot. Ironically, the litter diminished once we got about 30 minutes up a trail, about at the point where the park stopped providing trash cans and the number of Italian family groups dropped-off. Cigarette butts, candy wrappers, and toilet paper were never far from sight at the lower levels, a dramatic change from prior years. We wondered what had happened: "Why did the ratio between the Italians and the Germanic visitors suddenly flip this year?" Our best guess was that it was a combination of a broader marketing program of the mountain villages to the Italian people this season and the economic slowdown holding the Germans back. Not long after pondering this change, we caught a BBC story regarding a federal marketing campaign urging Italians to spend their money in their own country by "Seeing Italy" this year, which seemed like at least a part of the reason for the change. Curiously, on the first day of high season in Selva, the day on which we annually migrate by bike from Selva to Corvara which has no high season, the Germans were fully evident on the roads. Our migration day is always a Saturday because of the Saturday-to-Saturday rental scheme of the apartments, which is unfortunate as the weekends are predictably the busiest days on the area's scenic roads. As always, we instantly knew the Germans were on the road because they held up traffic as needed so as not to pass us on blind curves where many of the Italian drivers charge on by us regardless. Repeatedly we'd see a car behind us slowing until it was safe to pass and as they went around us, we'd check their auto plates for their nationality which usually bore a "D" for "Deutschland". We were perplexed by happily experiencing so many German motorists on the road and yet we hadn't heard them on the trails or in the villages. "Weekend visitors instead of week-long visitors" seemed a likely answer after pausing for lunch at a pull-out near the pass summit. Before we could assemble our sandwiches, a solo motorcyclist walked up to us as we sat in the grass under a pine tree. He asked where we were from and replied "I know that" when we said "The US." "Where in the US?" was what he'd wanted to know. We guessed that he'd identified our regional accent as he went on to explain how he and his wife had spent 7 weeks cyclo-touring on Hwy 1 along the Pacific Coast. His long visit with us included that he was on a 3 day motoring tour from Germany with 5 friends. Perhaps his was the more typical German holiday in the Dolomites in this year of austerity plans--perhaps the Germans were driving through rather than lingering. I never tire of this view from Val di Mezdi, high above Corvara. Our 15 mile migration from Selva in Val Gardena over Passo Gardena to Corvara in the next valley, Alta Badia, had us parking for another 10 days of hiking. 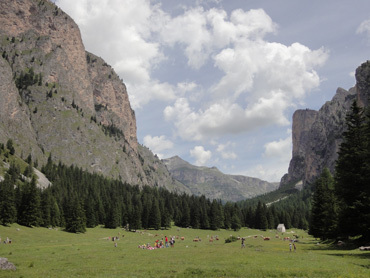 The almost daily threat of thunderstorms made it tricky to plan any full-day or high elevation events from Corvara, as had been the case in Selva. Bill only managed to squeeze in a single Via Ferrata route during the first week in Corvara and then the planning challenges got worse: the daytime highs dropped from the low 80's to the low 60's or below and snow was suddenly in the forecast (in late July). Fortunately the snow was at the 7900' level but the top of the lift from which we began our more ambitious hikes was at 8400'. So, as we often did in Selva this year, it was back to being fascinated by our feet instead of the highest mountain peaks. 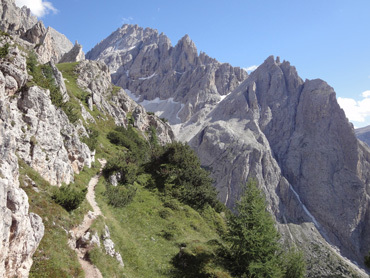 We treasure the Dolomites for the above-tree line hiking and the resulting grand panoramas but each of the villages provides an assortment of lower elevation trails that are great for foul weather or relative-rest days. This year we discovered a new-to-us forest trail from Corvara--a trail that allowed us to further refine our minimalist footwear technic. 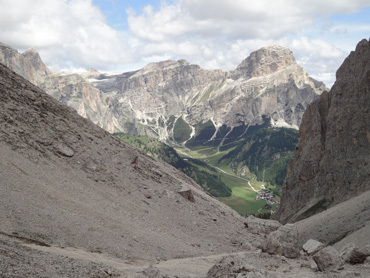 It was descending on Corvara's 2A trail from the top of Col Alto where we discovered the amazing capacity of our toes and the first bit of the ball of the foot to anchor us on steep dirt trails strewn with chunks of rock and crisscrossed with tree roots. It was there that we learned that by imagining digging in with our toes we could slowly descend without looking at our foot placement and with nary an "ouch." It was the missing refinement that we needed in the "toe pointing" image to increase both our speed and stability on the difficult but softer trails. We made note that if we ever were forced to descend on a steep trail in the dark, that an almost tip-toe foot planting approach was the most secure and least painful way to go. Val Pusteria, north of Corvara, has an idyllic multi-use trail that for us and many cyclotourists provides a fast, easy route out of the Dolomites and on to the Drau River bike paths of Austria. We've blasted through several times, thoroughly enjoying the stunning views and charming villages from the saddle. 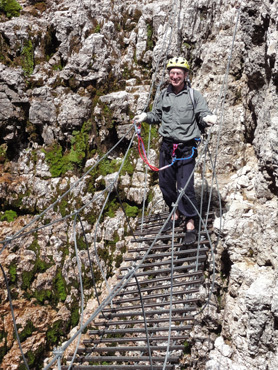 But this year Map Man had us lingering in search of ever-better hiking and Via Ferrata venues. Sweet little Villabassa's hiking trails turned out to mostly be grave roads, which isn't our idea of hiking, though we did discover its best asset, a lovely park. The Rotwand peak Via Ferrata from Moos. However Moos delivered, both with barely-doable (for us) Via Ferrata routes and steep, challenging out-the-back-door hikes. We enjoyed our week in Moos and as we've come to expect from the Dolomites, could happily entertain ourselves on our feet, even on the stormy days. Lavishing ourselves with 6 weeks in the Dolomites this year would have been a little disappointing had it not been for our unexpectedly big "fuss training" project. It was a 'green tomato' summer in the Dolomites with rain in the forecast almost every day. Fortunately the actual weather was much better than the forecasts but the near constant threat of thunderstorms made it too dangerous to embark on many full day hikes, especially with long stints on those lightening-attracting Via Ferrata steel cables. (The lifts also stop running during the lightening storms.) We did slip-in 3 Via Ferrata outings between the storms, 2 of them new routes to us, but Bill had planned to do many more than that during our extended stay. But the play with our feet was more mesmerizing than anticipated. The rentlessly rocky trails forced us to master our technics quickly. Everyday we inspected and talked about our toes, feet, ankles, calves, knees, and hips. We reviewed what we remembered about anatomy; recalled the myths we'd been taught about our feet, shoes, and walking; and periodically were inspired by new bits of online information about barefooting, running, and minimalist footwear. I watched as my medial quads grew bigger; my chronic knee issues dissolved; and my tendency to shift my weight on to my heels self-corrected. Bill revisited evolutionary issues regarding the feet; was constantly amazed by the toughness of the forefoot; marveled at the resiliency of the foot in general; and was dazzled by his heightening arches. Our time in the mountains in 2010 will be remembered less for what we took in by looking up at the mountains and the panoramas and more for what we learned by looking at our feet and listening to the subtle commentaries from our bodies. "It was on that nasty gravel descent above Villabassa where we shed our dependence on trekking poles;" "The forest hike on the outskirts of Corvara was the first steep descent we made without looking down at the trail;" and "Stevia's Petini was our first Via Ferrata in 5 Fingers" will reflect our most vivid memories of the Dolomites this year. Should you be intrigued, even more of what we learned is in a SideTrips file entitled: "Minimalist Footwear." Our almost-week long stay in tiny Fulpmes outside of Innsbruck is drawing to a close and soon we will bike into Innsbruck for a 2 night stay for some electronics shopping. Then it's on to Mayrhofen, a little out of Innsbruck in the other direction, for another week of hiking as Bill continues his endless search for more hiking venues that don't require a car to access. The weather for our 2+ months of hiking continues to be...well, just plain awful. 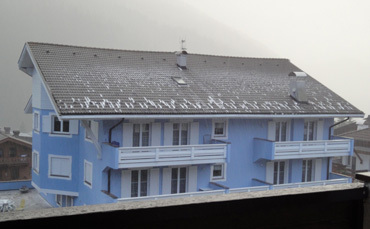 One just doesn't expect to get snowed on at noon on the 16th of August in the northern hemisphere but it happens. We are pressing on however with our cool, wet summer of shorter hikes, fewer Via Ferrata's (Klettersteig's here), and pushing our feet to their absolute limit in minimalist footwear. But we never hesitate for a moment: we'd rather be here finessing our way around the elements than doing almost anything else.